Recent interim results from Estia Health (ASX, EHE) marked a significant turning point on a number of levels in our view. The aged care provider declared its first interim dividend in two years and a mid-single digit increase in EBITDA. The company looks to be advancing its turnaround nicely under new senior management and should be a beneficiary of industry tailwinds. 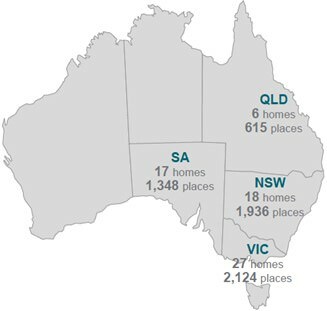 Estia owns and operates aged care facilities in Australia, and had 6,023 operational places at the end of 2017. The company also has a deliberate strategy of targeting higher income social economic metro areas, and customers who are after a ‘higher’ level of service. In the first half total revenues edged up 3.3% to $271.7 million, while the full year net profit after tax (NPAT) to 31 December 2017 increased 2.5% to $20.26 million. Operating revenues rose 3.3% to $271.7 million with increased revenue per operating bed day. Total revenue per operating bed day edged up from $260.2 in 1H17 to $265.1 in 1H18. A focussed effort has also seen occupancy levels lifted from a couple of years ago, and to 94.0% in 1H18. We expect this to rise further as the company engages in a material refurbishment program. Some 15 homes are currently undergoing refurbishment out of a total of 68 operational homes as at the end of 2017. The facilities upgrade should also be pivotal in lifting margins in our view. The company has also made progress on controllable costs as well, with non-wage expenses (excluding facility rentals) falling by $3.90 per bed from a year ago to $44.60 in 1H18. As a percentage of revenue, these costs have fallen from 18.6% in 1H17 to 16.8%. Following a $136.8 million capital raising in FY17, strong operating cash and RAD (refundable accommodation deposit) inflows, Estia’s balance sheet has been transformed compared to where it was a year ago. At just $42.3 million, Estia’s net debt is less than a quarter of what it was 12 months earlier and less than half of the $102.3 million it was at 30 June 2017. The company’s gearing range has fallen to around 0.5 times, well below the target range of 1.5 – 1.8 times. In terms of the outlook for the full year, the company reaffirmed FY18 guidance of mid-single digit percentage growth in EBITDA subject to no material change in market or regulatory conditions. Overall, the underlying thematic remains a compelling one. 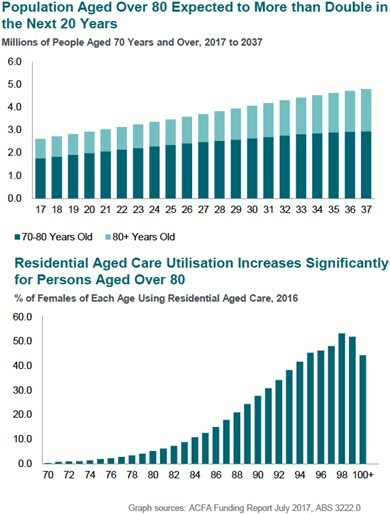 Australians are living longer, and many baby boomers are set to retire over the next two decades, increasing the demand for high quality aged care services. This is particularly as studies show that most retirees will need to cash up equity in their own homes, and move into care to sustain themselves in their golden years. We believe that the turnaround at Estia is progressing and the company is well placed to lift shareholder value under new senior management, with a stronger balance sheet and supportive industry tailwinds. Estia Health shares are trading on a FY18 earnings multiple of approximately 21 times, offering a yield of 2.6%. Disclosure: Interests associated with Fat Prophets own shares in Estia Health. Greg Smith is the Head of Research at Fat Prophets share market research and funds management house. To receive a recent Fat Prophets Report, call 0800 438 328 or CLICK HERE.